On February 27th, Wayland resident Rebecca Furie died at her home in Riverview Circle of a brain tumor. She was buried at Beit Olam Cemetery in Wayland on Monday, February 29th. 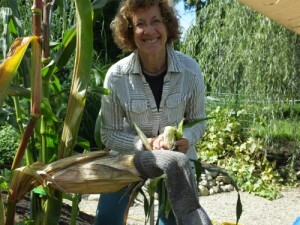 Rebecca moved to Wayland in 2010, when she rehabilitated a “problem plot” into a beautiful property with an energy-efficient house, a garden for tomatoes as tall as trees, a riot of asparagus, rare perennials and many kinds of roses. Soon after settling, she set out to get to know our town. She volunteered for the Rail Trail, helped out at the voting booth and at Friends of the Library book sales. And she checked out a group called Transition Wayland. This is how we came to be friends. This was in February 2012, when we screened the movie In Transition 2.0, in which we were featured. I remember it like it was yesterday, the woman with the red curls congratulating us on the event and promising to be in touch. We got to know her as someone who kept her promises. She became deeply involved in our work, growing seedlings for our community garden plot, holding an open house for Earth Day, helping with weeding, proofreading and moving compost, canning 300 pounds of peaches. We had many dinners together. She came to our kids’ concerts and plays. She always had kind advice, laughter, encouragement, and a smile. In the meantime she kept up her other volunteering, and it is amazing how many people in our town know her. In some cultures, your wealth is measured by what you give away, and Rebecca was wealthy beyond compare. Rebecca’s life with us in Wayland was the last chapter in a series of many lives, and she felt it was a deeply satisfying one. She entangled, grounded, and rooted herself here. From this place she embraced big, new challenges. She became interested in fundamental questions of community, culture, and life’s purpose. She loved what Stephen Jenkinson, with whom she and I studied, said to us: Nothing is hidden, but not all is revealed. Rebecca set out to be a scholar, to start revealing for herself and for those around her, what we sometimes don’t want to know. I found her immensely courageous. In 2015 she – who professed a fear of death old as childhood – initiated a program she called All Things Mortal, which she described as “a program designed to get us talking with humor and sensibility about our most taboo subject.” She organized a death cafe, also a workshop on home funerals, and spoke with many about green burial. She was fearless in her questioning and determined to make meaning, even beauty, of it all. When she became ill, all this was suddenly, literally, brought home. And she knew what she wanted: a good death at home, with lots of good work for all of us in life, in sickness, and after death. In Rebecca’s DIY spirit, twenty-one of her friends built her coffin in local white pine, and we helped her family with the home funeral. Stephen Jenkinson also writes that “Dying well is not the end of parenting, but the fullness of parenting, not the end of a marriage, but the last great act of a married life,” and, I want to add, not the end of friendship, but the sealing of friendship. We will never forget her and we will always boast of having been her friends.